***LOOK!! *** 99cent MEGASALE ON ALL BOOKS*** 27th Sep - 29th Sep 2014. 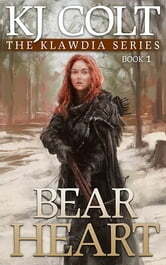 The competition is set amongst the perils of the Death Peak Mountains and pits representatives from Ruxdor's five strongest tribes—Bear, Lion, Wolf, Snake, and Hawgrald—against each other in a race to slaughter their tribe’s animal and return home. Each competitor is overseen by an opposing tribe’s elder to discourage dishonesty. Klawdia is seriously injured by the bear she must slaughter, and a rival both saves her life and sabotages her chance of victory by cheating. When elders start disappearing from the competition, Klawdia must draw on the last of her strength to expose the truth and save her family’s lineage. After reading all Healers of Meligna I had to learn more about Klawdia. A strong woman who stood in the face of stupid male adversity and ignorance, very capable of handling any situation with strength and courage. The first time I have enjoyed reading in the first person and learning more about inner strength. Thank you, KJ Colt. Excellent read.....can't wait to read further into this world!